I’ve been doing a lot of reading about various schemes to reduce America’s dependency on foreign oil. I like the idea of a diverse approach where energy is produced using a wide variety of different methods. Roof mounted photovoltaic solar panels, large and small wind generators, flex fuel vehicles and hybrid cars can all help. Cellulose ethanol, biodiesel, compressed natural gas and even fuel from algae are some of the latest alternatives to petroleum based fuels. But, it seems that many of the discussions on energy overlook one energy source which is just below our feet, at least here in the western half of United States where I live. I think hot rock geothermal energy is one energy source which has a lot of potential. The photo below is a geothermal energy resource map for the lower 48 states of the U.S. Note that a large portion of the western half of the nation has excellent energy potential. The red patches are areas where the rock temperatures can reach 200 degrees C (400F) or more, at a depth of about 10,000 feet. For many years this temperature was thought to be too low to be practical. But, some new so called “binary” heat engine systems can produce practical power from these marginal temperatures. As the illustration shows below, the binary power system is pretty simple. A number of deep wells are drilled into the hot rocks below at a depth of about 2 miles. High pressure water is then injected into the well, to fracture the rocks. Several injection wells pump cool water into the cracked rocks. Several more production wells, placed some distance away from the source wells, are drilled into the rocks. As the water seeps through the cracks, it picks up heat. The hot water is then brought to the surface. In an isolated heat exchanger, the hot water is used to boil a special liquid, which has a low boiling point temperature. The steam like gas produced is then sent through a turbine, which generates electricity. The cooler water from the heat exchanger is then sent back down the hole, to be recycled. Since the same water is used over and over, little additional water is needed and almost no well water mixes with surface water or underground aquifers. Several demonstration systems are now in operation in Alaska and Utah. One company called “Raser Technologies Inc.” uses a modular approach to their power generators. Their systems can range in size from 0.3 to 20 megawatts by ganging up multiple modules. 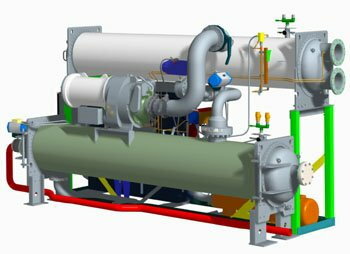 Each 300KW module has a heat exchanger, a boiler; a gas turbine and a generator. Each generator is tied into the main power grid. Larger 100MW systems are certainly possible, by scaling up the module size. Since the power generators can run 24/7 for 30 years or more, the total energy produced adds up and shortens the time needed to pay for the system in sold electrical energy. It sure makes economic sense to me. I especially like the fact that all of the energy produced would come from a non-polluting source. The energy producer does not generate any greenhouse gases and other than some water to replace that which is lost, no other resource is needed. Let’s imagine a 10MW power plant which runs 24 hours each day.10,000 kilowatts times 24 hours is 245,00 kilowatt hours per day. Multiply that by the going electrical energy rate of $0.10 per kilowatt hour and you get $24,000 worth of electricity, which could be sold each day. Multiply that figure by 365 days in a year and you get $8.7M worth of electricity sold each year. Multiply that by 30 years and you get $263M worth of electricity sold over the lifetime of the system. Even at $150 per barrel, an oil well would have to produce 1.7M barrels of oil over a 30 year period to equal the energy from one 10MW geothermal system. Such oil wells are just not found. It would amount to 160 barrels of oil per day for 30 years. An oil well might start out at 160 barrels a day but after a few short years, the production rate would quickly drop. I can imagine some communities investing in such an energy system. 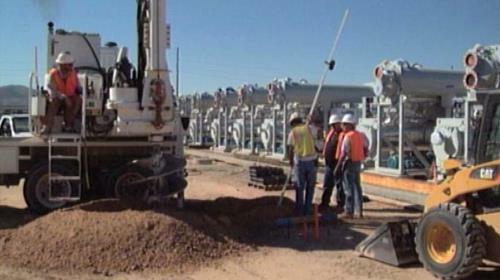 A town of 1000 homes might own its own 5MW geothermal power plant. This should be enough for all their electrical energy needs, including the charging of some 1000+ electric vehicles each day. Let’s assume the investing group wants a 5 year payback period for their 5MW power plant. This works out to about $22M for the cost of the complete system installation. That would put the cost at about $5 per watt. That may seem high but since the system runs 24/7 much more value energy is produced each day. When compared to say a photovoltaic power system, a geothermal system of the same power rating would generate perhaps 5 times more energy per day. Once the system was paid for the operating cost would be quite low. The real incentive occurs after the system is paid for. For some 25 years after the installation, the system would keep cranking out power with very little annual maintenance required. As cars move away from conventional fuels, I can imagine a roadside fuel station which might invest in its own geothermal power plant. It might use the power to produce hydrogen gas. I estimate that a 10MW power plant might be able to supply hydrogen gas to about 20,000 cars per day. Some have suggested that cheap electrical power from these systems might be used for other electrical power intensive industries. Metal production, such as aluminum, copper and steel all need large amounts of electricity. What other uses can you imagine? In addition to electrical power generation, the hot water brought up from the wells could also be used to heat greenhouses, homes and businesses.